You may have seen my first impressions and unboxing of this telescope. After having a few good nights of imaging to test it out, I’m happy to say it has lived up to expectations. Why choose a Ritchey-Chrétien Astrograph? Astro-Tech makes a range of Ritchey-Chrétien (RC) telescopes that are all designed specifically for imaging. (The Ritchey-Chrétien design is what’s used by the Hubble and most other large aperture professional instruments.) The AT6RC is the baby of the bunch, and with an entry price of only $399, putting it right next to similar sized Schmidt-Cassegrain telescopes from Celestron and Meade. The RC is heavier than an SCT of the same size, which also made me opt for the 6″ version instead of the larger 8″ (13 vs. 19 lbs). Given I still use a little Celestron CG-5 EQ mount, I felt going over 25 lbs when adding the cameras and guide scope would be pushing the mount a bit much. The big reason to choose an RC over an SCT is the flatter-field, no-coma imaging. While there are coma corrector & field flatteners available for SCTs, the example images I’ve seen still show a lot of elongation at the edges of the field. The AT6RC does have a little of this as well, fortunately Astro-Tech also makes a field flattener for $150 that works exceptionally well with these scopes. Note that there are coma-free SCTs available at larger apertures. Pricing tends to be similar to comparable sized RCs. The other question would be why choose this over an APO refractor. This really comes down to focal length and price. APOs are popular imaging instruments. Unfortunately, they’re also expensive (and heavy) for large apertures. A 100mm APO refractor will go for upwards of $1500. They have their advantages and disadvantages, but for me it came down to getting a larger aperture for a lower cost with a long focal length (1370mm for the AT6RC) for imaging the smaller deep space objects. I’ll add that I just ordered an Astro-Tech 65 EDQ, which is an APO with only a 65mm aperture and a 420mm focal length. I bought this specifically for doing wider-field imaging for objects like the Andromeda Galaxy, Pleiades cluster, and bright comets, and I’m impatiently waiting for it to ship! There are no eye pieces or star diagonal – this is an imaging telescope designed for use with DSLRs, CCDs, and WebCams. I already talked about build quality in the initial article, so I won’t repeat that here, other than to say the only negative I’ve found is the front dust cap fits either too tightly in warm weather or too loosely in very cold weather. 2″ Crayford focuser with 34mm of travel on a rotating ring with a 10:1 fine focus nob and focus lock screws. As far as I can tell, the telescope was perfectly collimated out of the box, and I haven’t had a reason to touch the collimation screws yet. The AT6RC doesn’t include a case, and the packing is molded styrofoam, which isn’t a good long-term padding choice since little pieces will break off that could wind up inside the instrument. I wound up buying a large rubbermaid type bin at a home depot, and cutting a chunk of extra memory foam I had to line it. This works extremely well for transporting the telescope, and cost less than $20. The scope includes a 2-inch crayford focuser with fine focus adjustment (10:1), a tension screw, and a lock screw. It also has a rotatable collar that you can loosen to re-orient the camera. This all works perfectly well with the Canon T3i and AstroTech Field Flattener, which makes for a very lightweight imaging chain (less than 2 lbs). I found for my camera with the field flattener, I needed just the 2″ extension ring and only extend the focuser a few mm to achieve focus. I have noticed the focus shift ever so slightly over a period of about 2 hours on a night that got down to about 16° F. I believe this was due to the temperature drop over that period and the effect that change had on the steel tube. The only way to even really notice was by using a Bahtinov mask. This is the heart of what you buy this telescope for. I’m taking all of my images with a Canon T3i DSLR, just like I used with the C6 SCT. First, while this IS NOT a fair comparison since I never bought a field flattener or coma corrector for the SCT, I want to show a pair of corner images from the C6 SCT and from the AT6RC. I’ll also add that the slight elongation in the AT6RC images is due to a tracking error, not the optics of the telescope. These corner images are completely unprocessed; the redder background is due to more sky-glow in the SCT image since they were taken different nights at different locations. I’ve found no reason to complain about the flatness of the field with this telescope and the ATFF. 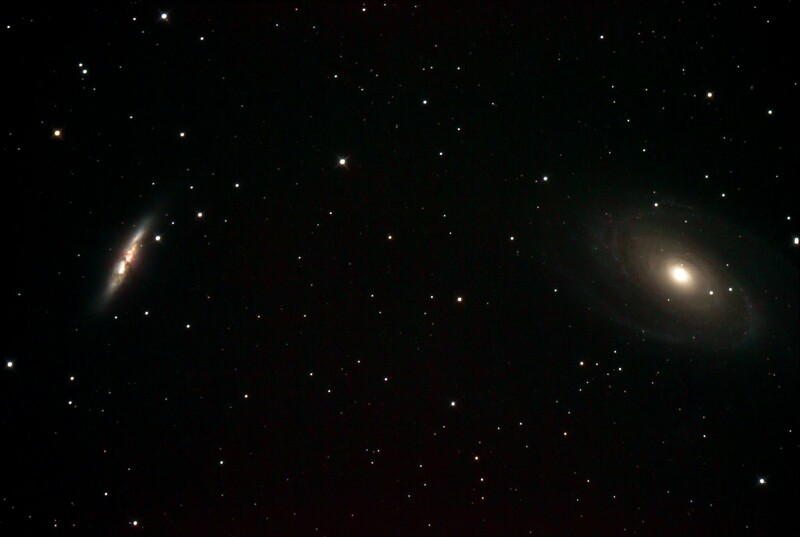 This flat field and the focal length made it just possible to capture both M81 and 82 in the same field, as shown below. 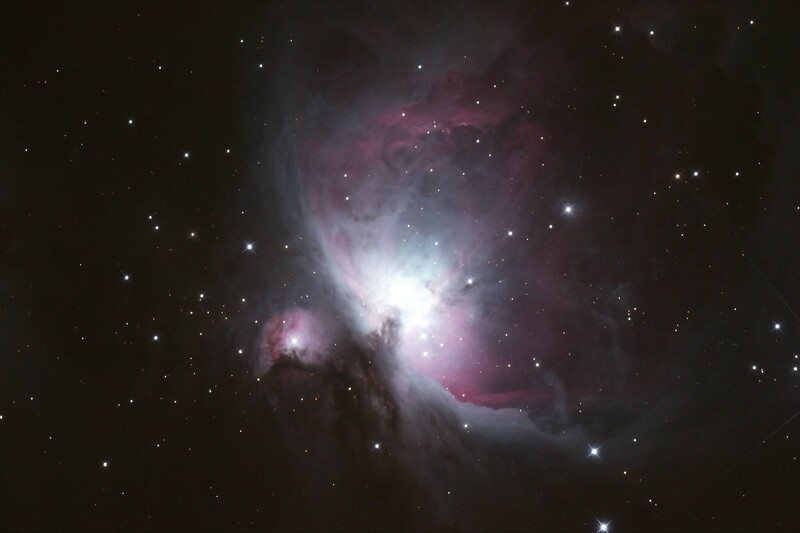 Another great example is the Orion Nebula. Here you’ll really see the diffraction spikes on the brighter stars. This is arguably the one drawback of the RC design. The diffraction spikes are caused by the spider veins that hold the secondary mirror in place. Personally, I find they add interest and a bit of depth to the images, as they only appear on the brightest stars in long exposures. 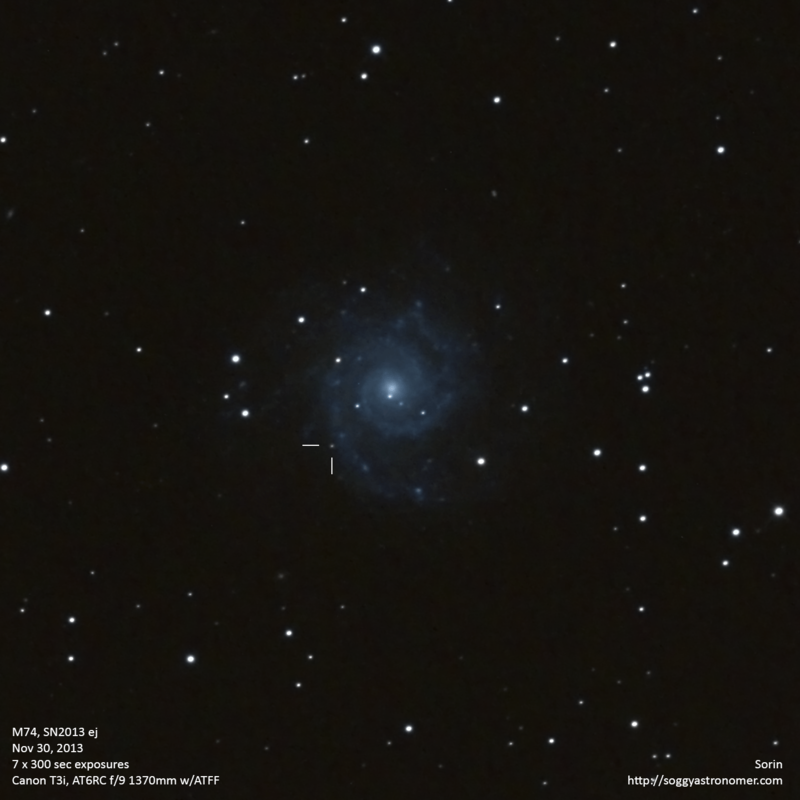 This last image of M74 is more heavily cropped but presented me with a surprise – a supernova, which at the time of this picture was down to 16th magnitude. While I still need a great deal more experience processing, and a better EQ mount, I’m quite impressed this little 6″ telescope can reveal such a faint object with a series of 5 minute exposures. I’ll also add that there is no vignetting with the APS-C size sensor in the T3i (22.3mm x 14.9mm). I took a series of flat frames that showed only a 5% light fall off from the center to the corners. A full frame camera would obviously give different results. Bottom line, I think the AT6RC is a great astrograph at a great price, even adding in $150 for the field flattener, which based on other sources, seems to work well on a wide range of telescopes. The only aspect that leaves me wanting is the aperture, but I feel the need to upgrade my CG-5 mount to something more robust before moving to a larger RC. The quality of the optics appears to be very good. Anecdotally, I think I got slightly sharper stars in the C6 SCT at the center of the field, but I’d need to do some side by side testing to quantify that. The focuser works smoothly and stays put, and the telescope delivers an excellent flat field with very little light fall off on the APS-C sensor of the Canon T3i. Highly recommended for any budget astrophotographer that wants a long focal length telescope. While you can sometimes find Astro-Tech scopes at other resellers, Astronomics actually owns the brand. View their list of RC Scopes for 6″ – 20″. The 6″ and 8″ models spend more time on back-order than available, but there are alternatives. Orion Telescopes has recently begun offering Ritchey-Chrétien scopes in 3 sizes: 6″ RC, 8″ RC, and 10″ RC. These appear to be identical to those offered by Astro-Tech, which are also branded elsewhere as GSO. Each retailer seems to offer a slightly different package, but the same scope and focuser. The Orion scopes quite handily include dual-finder scope shoes, so you can use one for an auto guider and the other for a visual finder. Regardless of the brand label, they are very good imaging scopes! 22 Responses to "Astro-Tech 6″ Ritchey-Chrétien Imaging Review"
Hi Sorin! Thanks for this review. Are the corner examples posted above at 100%? I’m really interested in upgrading to a RC but I want to get a better appreciation for quality in the corners on an APS-C sized sensor. Hello, I just picked up a 6″ RCT and have a mount that is just heavy enough to hold the scope and 2 finders…. perhaps my camera too but I’m guessing that puts the weight limit over the capacity of the mount. But I do have a canon T3i – I am hoping you will give me a couple pointers. 1) what do you think my max ISO should be set at? I deliberately overexposed at first so I could get the focusing dialed in but then I switched to ISO 400 but I didn’t get the star fields that you have. 2) how long of an exposure would you recommend? I tried 30 secs to start and worked all the way to 5 minutes but almost all of them had some elongation present. 3) what is the stacking and processing software you are using? 1) I generally shoot at ISO 1600; for most Canon cameras, this seems to be the right balance of sensitivity and noise. 2) Exposure time varies based on what you are trying to capture, the focal length of your telescope, ISO and sensitivity of the camera, how dark the sky is, etc. Bottom line is to experiment. If you don’t have an autoguider, you need one for a 6″ RC to be able to get pinpoint stars for long exposures. Short of an Astro-Physics mount with perfect calibration, most mounts (and it sounds like you are overloading your mount already) can’t track accurately enough for that long a focal length without the corrections provided by an autoguider. You don’t say what mount you have, but I’m guessing you would need an upgrade for the long focal length. I recommend starting out with something like an 80mm APO refractor – the shorter focal length is more forgiving of tracking problems, and you can do shorter exposures. 3) I shoot in RAW and do some minimal pre-processing in Lightroom, then use Nebulosity for stacking, and finish off in Photoshop. Hi- I was wondering if you would be able to comment on your experience with this scope as compared with the AT65EDQ. I have the AT65 presently and I was if this would be a mild upgrade for imaging. I really like my AT65, but I think having a little more reach would be very nice. I have an AVX and it runs my current setup extremely well (AT65, 50mm GS/OrionPro CCD guide, Canon DSLR). I don’t have the budget (or desire) to change my mount (the AVX is an outstanding value), but that brings up weight limitations. I would love to be looking at a 6″ Mak-Newt or 8″ reflector or SCT but all will put me over my weight limits when combined with the rest of my imaging gear. That lead me to the 6″ R-C. The price is right and the performance looks good. I have previously owned an old Meade Mak-Newt so I am familiar with the alignment issues. It can be a PITA, but it’s possible. I would very much appreciate your thoughts! The AT6RC and the AT65 are two totally different beasts. If you are looking for a long focal length on a budget, the AT6RC is a great option. Just realize that with that long focal length, your tracking needs to be about 4x more accurate than it is with the AT65. I’ve taken images with the AT6RC on a CG-5 mount, so I’m sure an AVX would handle it just as well or better. Just don’t expect long exposures of more an a couple minutes, even with guiding. Don’t know why, but didn’t get a notification about this question until just now, 2 months later! Very sorry! Just browsing the net looking for reviews on this scope. I’ve wanted to get into Astrophotography for a while now, and I ended up buying a cheap, used Meade DS-80EC with the Autostar. What a joke that was. The mount isn’t nearly rugged enough to hold the scope on target, let alone stick a camera on it. Plus, if I DO put a camera on top of the mounting rings, and remove the scope itself from the cracle, the mount still doesn’t work. So, I want something better, but I don’t have a ton of money to spend, and we all know how much money can be spent in this hobby. So, I’ve decided on the iOptron ZEQ25GT, this 6″ scope, and the Orion Magnificent Mini Autoguider package. I’m pretty sure that this is going to fulfill my needs to doing AP with a DSLR. I’m not a real visual observer, but I’ll keep that Meade 80mm. I’ve gotten the cradle removed from the mount and will get a Vixen bar to attach to the cradle, which gives me the capability to use the scope (even though it is only an inexpensive achromat) for visual stuff, or even wider field AP. If Stellarium is right, that scope and the APS-C sensor in my camera should, just, give me an edge to edge image of M31. Sorin, one other question. Now that you’ve had the scope for a bit, have you had any issues with the focuser on it with your T3i? The focuser works just fine. Plenty sturdy, even with a Canon 7D Mark II, which is about twice as heavy as the T3i. My cooled Canon t3 in a cold box and a field flattener weight ~ 1300 g altogether and the focuser works fine. I just have to tighten tension screws pretty hard. Thanks Igor, I’ll keep that in mind. I’ve been over on Cloudy Nights and they are recommending I don’t even get a R.C. to begin with. So, I’m not sure where I’m going yet. I use just the 2″ spacer, and find that with the field flattener, I only need to rack the focuser out a few mm to achieve focus. The field flattener adds about 1.5″ to the imaging train. The DSLR camera body itself adds about 44mm from the front of the lens mount to the image sensor itself. For someone using a CCD camera and no field flattener, they would probably need 2-2″ spacers to achieve focus, but for a DSLR with field flattener, you probably need just a single 2″ spacer. You can also easily test your focus in daylight by pointing at a far-away object. Once you get past a certain distance, the focus effectively is just infinity, so it’s the same for a tree 3 blocks away as for the stars millions of miles away. Sorin – interesting stuff. I had heard the name R-C before, but didn’t know anything much about it until reading your posts. Obviously, it is intended for AP, but how is it on visual? The reason I ask is because of collimation. I don’t want to get involved with collimating anything. That’s why I bought my Mak, because as between a Mak (which always seems to get described as having “Apo-like views”) and an actual Apo, the price difference is enormous for the aperture. My 5-inch NexStar 127SLT is just $429 at Amazon, which I think is a steal. In reading up on the R-C design, or at least this Astro-Tech 6, it says that the primary is fixed, and only the secondary can be collimated. You’ve had the scope for almost a year now – still no collimation required? And have you ever taken it out for use as a visual scope? I’d be very curious as to what you think about the views you get from this scope. The reason is because I am looking for an upgrade path from the Mak. The next step up – a 6-inch iOptron Mak – would be almost double the price of what I have. This 6-inch R-C would be about the same price. It’s not as if I have any money to do this now, because I just bought the Mak a month or so ago, but I’d like to start fantasizing about what my next scope is gonna be. Is that weird? Hi Jon, sorry for the delayed reply. I have needed to collimate the AT6RC now, but that was primarily due to having it slip off the mount and drop on my foot (ouch!). I’ve come across a few tricks for collimating these RC scopes, including a “hall of mirrors” trick that seems to work really well to fine-tune the collimation (google RC collimation). You can actually adjust both the primary and secondary mirrors; there are adjustment screws for each, and Astronomics has a downloadable instruction sheet off of the product page. I bought a chesire eyepiece for collimation, which works reasonably well. It took me some fiddling to figure it out, but the scope is performing well. Excellent review Sorin. Getting an RC over an SCT has been a recent consideration for me. I was thinking of the 9.25 EdgeHD with an equatorial mount like the iOptron CEM60. That is after I sell my CPC1100. I love the CPC, but it’s too difficult to haul around. I currently use my AT106 APO for imaging with a 60Da DSLR and the combination works very well with the iOptron ZEQ25GT mount which by the way would be something you might consider. It has a payload of 27 lbs and my imaging set up is 20 lbs. I may be pushing the mount a bit because I seem to get slightly better tracking using my lighter C80ED. The ZEQ25 mount+tripod is only 27 lbs, 21 lbs if you were to get the tripod with the 1.5″ legs. I can carry the complete set up outside in one piece without the counterweights on. I don’t do that, but it can be done. I’m having some indecision over the fact if I get the RC over the SCT I loose my visual astronomy which I still like to do now and then. But once I decided to try imaging early this year my visual activity dropped off to zero. I just ordered a similar scope (the OPT branded one), and I was wondering how essential the flattener is. I’ve had some troubles finding a good comparison shot of with and without them. Do you have any examples you could share? Hi Robert. I haven’t gotten around to it yet. I did get a 2″ adaptor in part to test this, but the weather has been uncooperative in the extreme. I’ll try to add this when I’m able to test it. Hi Sorin, hey! Super review! Thanks for sharing your findings. I’m reading everything I can find on some first AP kit and so far preordered an AT72ED, the flattener and an adapter for my skytracker. Thanks to you and an apparently outstanding product I believe the AT6RC will be my next piece. Do you have any followup details on the AT6RC to share? Thanks again! I own this OTA since a few months and I am trying to guide with my ASCG5GT. But I didn’t get good results and I don’t know if there are just guiding errors as expected or collimation errors. Have tried to collimate using a chessire eyepiece, laser collimator and my last try was using a on zenith star…My OTA collimation seems to be quite good but …not the results (using my Canon DSLR at 800ISO and 300 seconds). Which tecnique do you use for collimating this OTA?? Hey Sorin, Chris Doll here and thanks for sharing your experience with this astrograph. I’m seriously considering one of these as my own AP setup. Would you consider the Celestron VX-Mount to be a suitable upgrade for the mount? Or something even more robust? I haven’t found any good comparisons of the performance of the AVX vs the CG5, which is unfortunate. If I were to buy a mount today in the sub-$1000 range, I’d pick the AVX. With a higher budget, I’m not sure what I’d choose. Owning the CG5 today, I’m starting to look for something in the next class up. The CG5 doesn’t handle the long focal lengths all that well for long exposures. An AVX may do better, but it isn’t clear by how much.